Although our main focus is beef, we began raising organic pork on our farm to see if the pigs would complement the pasture-based system we use. We are happy to say that we are very pleased at how well the pigs have fit in, and we are also very pleased with the quality of the pork they produce. As far as we know, we are the only source for organic pork that is certified organic, soy-free, SPCA certified, and also 100% pasture-raised, in the Lower Mainland of BC. Today's supermarket pork comes from barn-raised pigs which have been selectively bred to be extremely lean, rapid growing, and capable of surviving in a confinement operation made out of concrete & steel. They are given high-doses of dewormers (drugs) and other pharmaceuticals, and never see a blade of grass in their lives. Their meat contains very little fat, and even the fat it does have is so lacking in nutrients it's unhealthy. Compare that image to the one that our great-grandparents had, around 150 years ago: pigs running around outside, eating anything and everything they could forage from the pastures and the woods... digging for roots with their shovel-snouts... cleaning up windfall fruit from the backyard orchard... lazing blissfully in the sun... sleeping in dug-out nests they've built themselves. The pigs of those days looked different than commercial pigs do today. They had more lard on them, because our ancestors treasured the fat, which they knew to be healthy. Pigs were raised specifically to provide not just meat, but plenty of lard --- which got used for baking, frying, in soups, spread on bread, and even making soap. Our ancestors ate so much lard it's startling from today's perspective. Were they ignorant? Maybe they were wiser than today's "experts". About one-hundred years ago, the "scientists" and marketing professionals began telling our ancestors that animal fats were unhealthy. They convinced home-makers that they were poisoning their husbands and children with all that unhealthy lard and butter. If only they'd leave behind those primitive foods, they could begin enjoying the myriad health benefits of hydrogenated fats, such as Crisco. The chemists of the industrial research laboratories figured out how to make non-foods (like cottonseed oil) look exactly like real foods (lard and butter). By adding some flavoring, they found they could turn out artificial products that looked and tasted like real food. And they could make them cheaply, too. A new era in non-food was born. It's taken a hundred years, but we've started to come full circle. Now, we're re-discovering the things our ancestors knew. We're getting rid of margarine and unhealthy oils, and replacing them with butter and lard. And as we're doing so, we're healing our bodies, our animals, and our planet. We've found out that pasture-raised organic pork is very high in Vitamin D and Vitamin A. We've learned that it's also high in monounsaturated fat (good), and Omega-3's (good again). We've discovered that pork/lard from pasture-raised pigs (preferably organic) is healthy (unlike confinement-pigs, whose meat/fat is unhealthy). We've understood that lard from healthy pigs is a brilliant and vital addition to our diets. When we first got the pigs, we didn't know if we'd enjoy raising them. But we can tell you now that we're very happy we got them... and so are they. Pigs (in particular the old-fashioned heritage breeds we have including the highly-prized Berkshire pig) are remarkable and fascinating creatures. They were designed to use their noses as shovels. They dig, dig, dig... all day long. That's what they do. To them, that's blissful. They also love being in contact with the earth. Not to sound mystical, but they are positively drawn to the ground, as if there is an invisible connection between pigs and the soil. And, they are intensely curious creatures. When pigs are allowed to be pigs, they turn-over the soil like a plow... they add rich manure to the earth... and they build healthy soil in a way that no other animal can. In short, pigs make a wonderful contribution to a healthy, productive farm. We've put together a selection of pork products which we believe you'll really enjoy (we know we do). We particularly enjoy the 100% pork breakfast links, and of course the pork chops (which are very flavorful and the fat is a joy to eat). We believe you'll especially like the hams and roasts too, which are wonderful for special meals or Sunday dinner. And by the way, you'll notice our hams, roasts, and chops have a higher fat content than the pork you've tasted from the supermarket. That's ok. It's healthy fat, and you're meant to enjoy it. The supermarket pork has been bred to be excessively lean, which really defeats the whole purpose of eating pork in the first place. Regarding pork lard, you can buy it in packages from us on our order page --- but remember it is unrendered. That just means you need to heat it slowly in the oven, on the stove, or in a slow-cooker before you use it in whatever recipes you choose to use it in. Basically, you can use lard in most of the ways that you would normally use vegetable oil, Crisco, or margarine. If you would like to learn how to render lard, it's easy to find out by searching the web. The better you get at rendering lard, the higher the quality will be. And as you begin incorporating lard into your diet, be assured that it's loaded with essential nutrients that are difficult to get from any other source. You've heard that a large portion of the population is Vitamin D deficient. Yet healthy lard is a tremendous source of Vitamin D. And we know that healthy lard is filled with the fats which are necessary to maintain proper skin, brain, and immune-system health. Plus, healthy lard provides us with monounsaturated fats which our bodies need. And remember, the nutrient value of the lard is extremely dependent on how the pig is raised and what it eats. 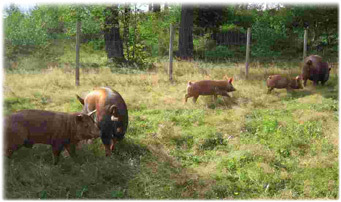 Pigs need to be raised on pastures or in the woods, where they can eat roots, grass, shrubs, and (ideally) fruits, berries and nuts. Any feed they get from the farmer needs to be (of course) certified organic and hopefully soy-free (the feed we supplement our pigs with is 100% soy-free and is certified organic). The result is, we believe, the best tasting and healthiest pork you can buy.